If you’ve ever wanted to see a pan-sized panfish, then here is your chance. According to Arizona Game and Fish Department, Hector Brito hauled in a pending world-record Redear sunfish out of Lake Havasu. The fish weighed 5.78 pounds, which would break the record of the old fish that weighed 5.55 pounds. Brito was fishing the chalk cliff area of the lake when he had a hard bite on his drop-shot rig that was fixed with a No. 8 Aberdeen hook and a nightcrawler on the end. The Redear sunfish that live in Lake Havasu reach epic sizes because they eat the invasive quagga mussel. 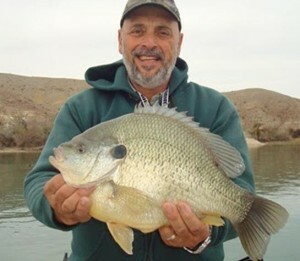 Many local anglers and experts believe that there are 6 pound sunfish swimming in Lake Havasu. This sunfish is absolutely huge and you can see from the photo that it looks to be about 15 or 16 inches as well. Send us your largest fish photos and we’ll be sure to post them on the site. Be sure to get the latest Fishing News and Tips on MorningMoss.